3D printing is a process, whereby a 3D CAD design is manufactured on a machine capable of producing a solid form / model. 3D printing is already important as an industrial process, in the production of some tools, textiles, toys, jewellery and a range of components. The technology also has been used in the medical world, in the manufacture of custom made prosthetic limbs and hearing aids. It even has a practical application in the world of dentistry. Research has been taking place for several years on ‘bioprinters’. These are complex 3D printers, capable of printing bio-structures, used in surgery. The cost of 3D printing machines is falling and it is now possible for most hobbyists and educational establishments interested in this area, to purchase cheap and reliable machines. An example of a typical 3D printer is seen below. 3D printers construct a ‘model’ by building up layer upon layer of PLA, Nylon or ABS, fed from spool, usually at the back of the printer. Each layer is a fraction of a millimetre and building even a small model can take sometime. 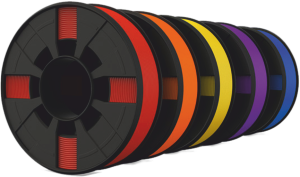 The PLA / ABS is purchased in the form of filaments on open spools (see opposite). 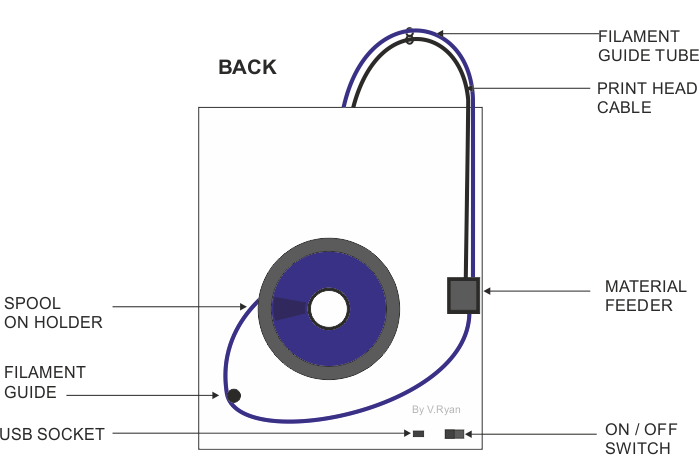 Filaments tend to be 2.85mm diameter (known as 3mm filament), rolled on to a spool. The spool fits on a roller, normally on the back of the 3D printer.